No matter how you store harvested perennial grasses grown for biofuel feedstock, be sure to minimize dry matter losses and maintain uniform physical and chemical properties. Funded by AFRI. Learn More. After-harvest storage methods of switchgrass and other perennial grasses grown for biofuel have a significant effect on the profitability and success of an enterprise. Depending on how it’s harvested, feedstock can be stored as round or square dry bales, or as a moist product in bunkers or silo bags. As with forage grasses, each method has advantages and drawbacks. Regardless of the method used, producers should ensure that the stored grass retains as much dry matter as possible, while making the harvest and storage operation efficient and cost-effective. It’s also important that feedstock shipped to a biorefinery have uniform physical and chemical properties. 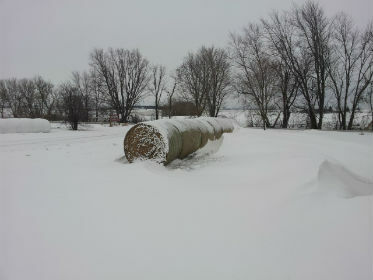 Storing round bales of switchgrass outdoors and uncovered leads to losses and non-uniform physical properties. Photo credit: Kevin Shinners. Because the main objective of growing bioenergy crops is to maximize biomass yield, switchgrass is typically harvested only once a year—unlike forage grasses, for which quality is usually the goal. Hay and forage equipment currently available can be used to harvest biomass grasses, but its capacity may be limited due to the high volume that results from one harvest per season. This can add inefficiencies to the process. For example, baler speed for bioenergy crops may have to be slower than baler speed for forage switchgrass because the balers must handle windrows with larger volume. Manufacturers are slowly introducing new hay and forage equipment to alleviate some of these drawbacks. After they have been harvested, biofuel grasses have several storage options. Most biorefineries that are considering using biomass grasses as a feedstock are focused on delivery as dry bales. Baling as dry as possible minimizes dry matter (DM) loss during storage, provided the bales are covered. No matter how feedstock is wrapped—whether with twine, net, or plastic—when bales are stored under cover, DM losses are low: on average, just 3%, according to research. However, storing bales indoors or under tarps is expensive, so alternative outdoor storage methods should be considered. 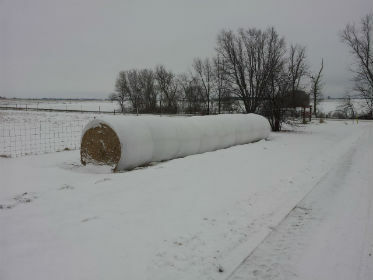 Wrapping bales of switchgrass in thin layer (~2 wraps) of stretch film is an economical way to reduce exposure to the elements, conserve bale value, and maintain uniform physical properties. Photo credit: Kevin Shinners. There are also drawbacks to outdoor storage. DM losses are higher, and the outer layers of bales, exposed to the elements, weather and decline in quality, leading to inconsistent properties. DM losses of up to 15% have been reported in bales stored outdoors. During outdoor storage, microorganisms in the bale consume easily digestible carbohydrates, thereby increasing the percentage of the bale that is lignin and ash. In thermochemical refining processes, bioenergy feedstock high in ash produces an undesirable residue of slag, or waste. Recent research sponsored by the CenUSA project has shown that round bales wrapped with just two layers of stretch plastic film had similar DM losses to bales stored indoors. This is the type of alternative storage strategy that can result in high-quality, low-cost feedstock. Compared to bale systems, chopping grasses with a forage harvester requires less labor; produces a size-reduced product at harvest, thereby eliminating bale grinding; and results in well-conserved, uniform feedstock. Research has shown that switchgrass stored in a silage bag had DM losses of as low as 1.1%, but more typically from 2% to 4%. Another benefit of chopping is that it reduces the particle size of the biomass at harvest, which reduces costs by eliminating bale processing. When grasses are chopped for ensiled animal feed, the target harvest moisture is 60-65%. This moisture range is used to promote the strong fermentation needed to maintain silage stability, especially during the long feedout period. But this moisture level is too great for economical transport of a biomass feedstock, so researchers have investigated storing low-moisture grasses anaerobically. For example, producers can ship 44% more DM per truckload when biomass is at 35% moisture, compared to 55% moisture. As long as anaerobic conditions are maintained, excellent conservation of low-moisture grasses can be achieved. However, a major disadvantage of chopped switchgrass is its low bulk density, which makes shipping more expensive because the load is limited by volume instead of weight. For example, grass bale density is typically 11 to 12 lbs/ft3, while loose, chopped dry-grass density is 3 to 6 lbs/ft3. Compacted density of chopped grasses in a silo bag is 9 to 10 lbs/ft3. Research is underway to develop ways to ship chopped feedstock at the density achieved in silo bags without excessive energy expenditures or costs. Moisture Profiles: Spatial distribution of moisture in round bales of switchgrass stored outdoors from October through June. Photo credit: Kevin Shinners. The choice of storage method for perennial grasses grown for biofuels depends on several factors, including the producer’s harvesting and handling equipment and storage capabilities, and the requirements of the end user. Regardless of the method chosen, producers should ensure that DM losses are kept to a minimum, and that physical and chemical uniformity of the feedstock is maintained. All of these factors must be considered while striving for an efficient, cost-effective system. Optimizing Harvest Logistics of Perennial Grasses Used for Biofuel, Kevin Shinners, CenUSA Bioenergy. Farm-scale anaerobic storage and aerobic stability of high dry matter perennial grasses as biomass feedstocks. Biomass and Bioenergy. Williams, S.D., and K.J. Shinners. 2014. Revisions submitted. Harvest and storage of two perennial grasses as biomass feedstocks. Shinners, K.J., G.C. Boettcher, R.E. Muck, P.J. Weimer, and M.D. Casler. 2010. Trans. ASABE 53(2):359-370. CenUSA Bioenergy is a coordinated research and education effort investigating the creation of a regional system in the Central US for producing advanced transportation fuels from perennial grasses on land that is either unsuitable or marginal for row crop production. In addition to producing advanced biofuels, the proposed system will improve the sustainability of existing cropping systems by reducing agricultural runoff of nutrients in soil and increasing carbon sequestration. CenUSA is supported by Agriculture and Food Research Initiative Competitive Grant no. 2011-68005-30411 from the USDA National Institute of Food and Agriculture.